Without a doubt the battery life of the Samsung Galaxy S7 Edge is far ahead of any other Samsung phone I have owned. With a few tweaks I am now getting on a bad day 6.5 hours screen on time. Normally with previous Samsung phones the longer you use it the worse the battery becomes. However the S7 Edge is a different kettle of fish. So how does 10 hours screen on time sound! Well that’s what I got yesterday. Now that was with my main sim installed. Push email on 3 accounts. Music streaming. Camera. Facebook. Twitter. Google+ . I have nothing special in terms of settings. Samsung regulates all the apps and adjusts them for power saving and over time thats the only difference made. Auto brightness is on. 30 second for screen on, with smart stay on. Bluetooth and Wi-Fi both on. Gear S2 connected. 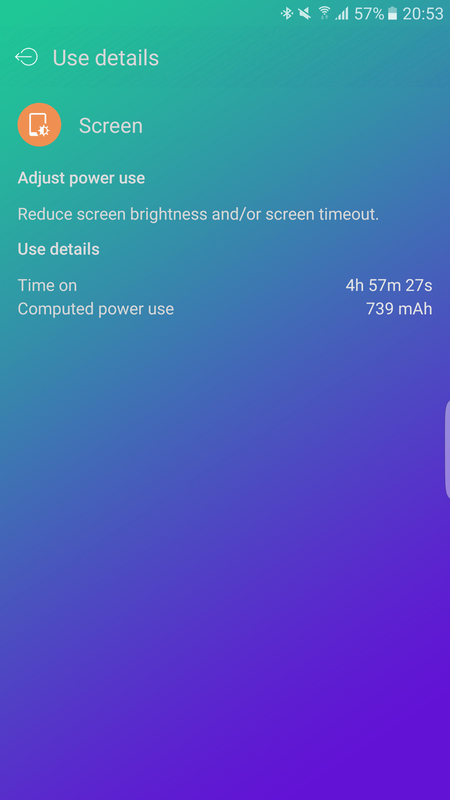 I haven’t been able to for more than 5h SOT on my S7 Edge. I am not sure how if it really those settings in the “App power saving” are really working. It currently says “Saving power: 0 apps”. Indeed I’ve only had my phone for like 2 days and the “evaluation cycle” is 3 days minimum. Does the same functionality look any different on your? I mean anything different from “0 apps”? “With a few tweaks I am now getting on a bad day 6.5 hours screen on time.” … I still don’t get which tweaks are you talking about? Care to share a bit more in detail. Yes I have loads of apps now being activated in the app power saving function. I have installed 117 apps. Those include games. Sorry Gavin, what you say means that you actually have a different “Saving power: 0 apps”… say 14 or 53 or whatever other number of apps “optimized”. Care to share a screenshot? Under settings, battery , power saving apps, it says 60 apps are being optimised. I haven’t changed or touched the settings. So it’s automatic. I have had the S7 Edge for much longer than yourself so it is obviously something that improves over time. Marshmallow seems to really help. Since the update my S6 has gone from just about making it through most days to easily making it. It’s actually the best battery life I’ve had on a phone for ages. Not 6.5 hours good though. That is impressive. Agreed, has improved battery standby time on my Note 5. Wow, which theme is that? Flatron. It’s in the Samsung Theme store. How does it compare with your 6S Plus battery life? Slightly ahead now. The bit that’s nice is faster charging and qi charging. Was expecting some thing north of 6h. The latest firmware updates must have tackled drain. What is particularly telling is the time of day in that screen shot. Nearing 9pm and not even half down !! Hardly. Was using the S7 Edge nearly all day. Why has it nearly doubled since you got it ? Used to be little over 5 hours now had you run it down you’re looking at nearly 10. It is something to do with a feature that Samsung has with the S7 called app power saving. After 3 days it works out a mode for each app dependant on usage. Seems to work marvels. Depending on what sort of day I have in terms of usage 6.5 hours SOT is more realistic as an average. Really can’t believe how pervasive the S7 Edge is compared to older Samsung models. Going to be a big hit. Wonder whether you mean the regular power saver mode ? That mode did not make much of a difference in earlier models. Slow things down a bit and dim the screen. The apps power saving doesn’t dim the screen or impact processor. Got it now, it’s apps optimisation. They introduced it in 5.1 on the earlier models. A kind of Greenify without root. Allows you to set number of days and if the app is not used it ensures the app does not run in the background. Won’t work with system apps, Google play services and the like. This will help cut down any mysterious drain because there is no way to figure out which app(s) was responsible otherwise. Only apps that are in the foreground use power. Thanks. Seems to be fairly effective. Samsung is doing something extra which will give them an edge over the sd820 in terms of battery. Throttle with extended use. Temperature reaches close to 40 but never goes over. The 820 won’t throttle as much and get hotter. The result is shorter battery in comparison to the exynos but benchmarks better. Take that, apps optimisation and doze to help with standby and battery lasts longer than in the past. Was watching a YouTube playback test that Max made and was amazed to see the s6 last 30% longer than it did last April when it came out. Little over an hour longer.